Attack 1 : Lightning BOOM! 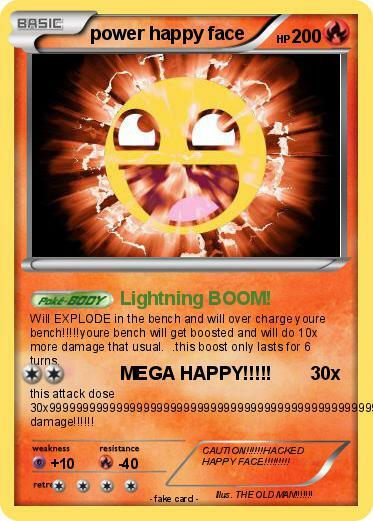 Will EXPLODE in the bench and will over charge youre bench!!!! !youre bench will get boosted and will do 10x more damage that usual. .this boost only lasts for 6 turns. Attack 2 : MEGA HAPPY!!!!! this attack dose 30x999999999999999999999999999999999999999999999999999999999999999999999999999999999999999999999 damage!!!!!! Comments : CAUTION!!!!! !HACKED HAPPY FACE!!!!!!!!! Illustrator : THE OLD MAN!!!!!! !